Top 5 language hotspots, October 2007. In the 21st century our planet’s natural resources have become endangered. It is widely accepted that the biosphere—the sum total of the planet’s flora and fauna—is in great peril of collapsing as human populations make a massive impact on the natural world. But what is not widely known is that the human cultural “biosphere” —the sum total of all human cultures living on the planet today—is in even more peril. Over half of the 7,000 languages spoken in the world today are likely to disappear this century, and with them we will lose a wealth of knowledge about human history, culture, and the natural environment. Most of what humans know about nature is encoded only in oral languages—languages that have never been written down or recorded. We face an immense knowledge gap: indigenous people often know more about local life forms than scientists do. Languages, often little-documented languages, contain an irreplaceable knowledge base about our connection to land, animals, and the ecosystem. We stand at a precipice in human history. We are losing huge repositories of human knowledge with the demise of every language, every culture, and every elder who holds the key to their language. And within these languages are complex understandings of our ecosystem—the same ecosystem that we must understand fully to survive. The passing of a last speaker is equivalent (in the loss of knowledge to humanity) to burning down a sacred library of unique and profoundly important information. It is imperative that we preserve the knowledge embedded within these languages for future generations. Under the National Geographic Society’s Enduring Voices Project, scientists meet with last speakers, listen to their stories, and document their languages with film, pictures, and audio to preserve their knowledge of species, landscapes and traditions before it vanishes. In addition, the Enduring Voices Project, where invited, assists indigenous communities in their efforts to revitalize and maintain their languages. By using video, still photography, audio recorders, and the Internet, the Enduring Voices Project will help empower communities to preserve ancient traditions with modern technology. Where on the planet do we find the greatest threat of language extinction and how can we prioritize resources to respond to the crisis? To address this challenge, the Enduring Voices Project has introduced Language Hotspots. 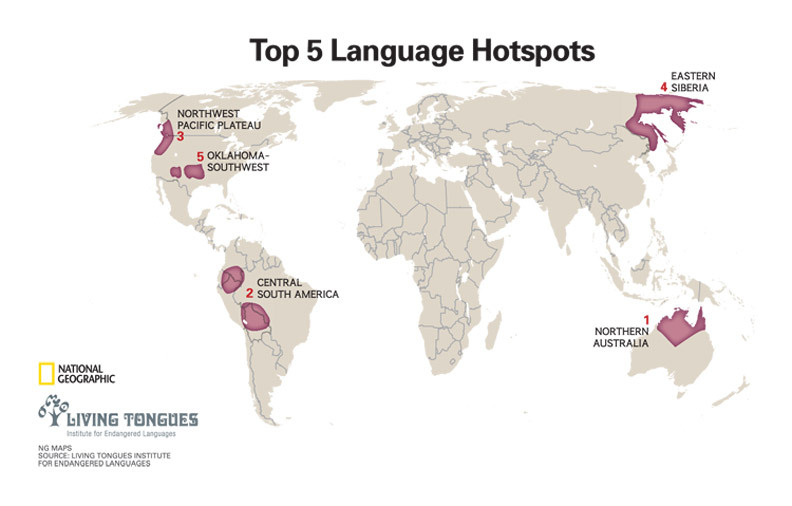 Language Hotspots was conceived and developed by Dr. Greg Anderson and Dr. David Harrison of the Living Tongues Institute for Endangered Languages. It is a radically new way to look at the distribution of global linguistic diversity, to assess the threat of extinction, and to prioritize research. We define hotspots as concentrated regions of the world having the highest level of linguistic diversity, the highest levels of endangerment, and the least-studied languages. Rather than simply counting languages, Hotspots take into account the number of language families (which we call "genetic units") represented in an area to calculate linguistic diversity. Click here for more on Language Hotspots, our expeditions and the expedition team.